Leaders can make or break a company—which is why coaches are so crucial. Effective coaching can ensure that executives reach their peak potential and drive organizational results. 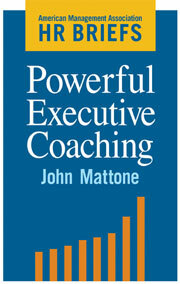 Powerful Executive Coaching delivers a concise, but powerful look to how to coach current leaders and high potentials. It goes straight to the core components of successful coaching: assessing and enhancing the essential inner-core attributes (i.e., resilience, empathy, creativity) and outer-core skills and competencies (i.e., decision-making, critical thinking, communication) required of excellent leaders. Including carefully selected worksheets and tools, Powerful Executive Coaching explains some of the most critical skills, such as how to: handle a coaching intervention • prepare individual development plans • structure and conduct coaching effectively • interpret feedback • deal with resistance • and promote self-awareness. It’s just what you need, and only what you need, to get started on high-impact coaching that will drive leaders to success.